There are times in clinical practice when a clinician may want to give out their private mobile numbers to certain clients for many different reasons. Coviu room links are a bit like private mobile numbers. And sometimes you may want a patient to skip the booking step and the queue, allowing direct access to a clinician's room. You can do that through "Customer Connect" by enabling "Connect to Provider". However, now, anyone who clicks on your "Customer Connect" button can discover all your clinician rooms and randomly drop in on them. This is why Coviu has created 'Access Controls' for the "Connect to Provider" functionality. 'Access Controls' allows for either a pre-set code or a time-based token to gain direct access to a clinicians room. 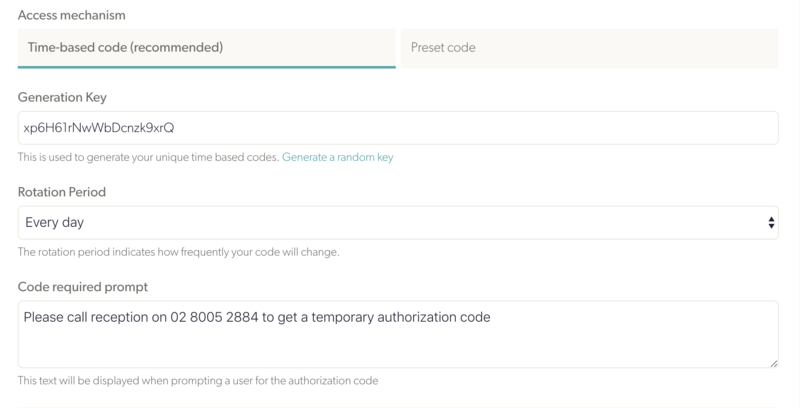 With the pre-set code, you can have a fixed password that you can give to patient to enter. It never expires. With the time-based token, the pass phrase changes, e.g. every day. You can choose how often it resets. To activate these access controls simply go to your main admin dashboard and go to configure. Toggle to click enable access controls till it shows up green. The Preset code option is like a password that you can give out to clients to access their clinicians directly without making a booking. You set it once and then need to let your receptionists know, in case a patient calls and wants to see a clinician immediately in their room. With time-based codes, a random keys is created that remains active for a pre selected time frame. When a patient calls and wants to see a clinician immediately, you go into Coviu, check under "Customer Connect" and click to 'View' the Authorization. The currently active code appears.